The Digression on the Value of Silver in Chapter 11 of Book 1 is one of the longest and most difficult chapters in Adam Smith's The Wealth of Nations. I started publishing the simplified version of The Wealth of Nations from Book 3 instead of Book 1 simply because I knew that simplifying the Digression in Book 1 would require a lot more time and effort. Smith wanted to prove that gold and silver prices are not correlated with the wealth or poverty of society. Instead, he wanted to prove that it is the money price of some rude produce relative to the main food grain (such as wheat), which is the clearest indicator of a society's wealth or poverty. In the same way, we want to objectively prove that GDP (measured in dollars) is not a proof of the wealth of a country, so we follow Smith's methodology in getting the 'grain values' of key rude produce to easily say whether the US or China or the EU is really wealthier and which country's wealth is based more on real value, instead of fake or nominal value. Who wouldn't want to live in a country that has more real value and is more resistant to economic crises? Purchasing power is the net revenue from GDP or gross revenue of a society. It is made up of the net profits that go to the wallets of business owners, and wages that goes to the wallets of employees. The expenses for tax payments, interest payments, fees, etc. are deducted from the computation of net revenue. For example, the GDP of Singapore is $323.9 b. Its purchasing power would be the GDP minus tax payments to government and the cost of money used up in producing that GDP. The Grain index, as stated in the Digression is the ratio of the price of commodities to the price grain. For example, if a kilo of rice in the Philippines $0.75 and a kilo of chicken is $2.50 then 1 rice : 0.33 chicken. Assuming a kilo of rice in Vietnam is $0.50 and chicken is $5, then 1 rice : 0.10 chicken. So it means that chicken is really cheaper in the Philippines, meaning that while Vietnamese enjoy cheaper rice, Filipinos enjoy luxuries better (to Smith, meat is a luxury). This is consistent if we replace chickens with cars. A Toyota Vios is 16,000 kg rice in the Philippines, but 44,250 kg rice in Vietnam. So by combining supply side GDP or Purchasing Power and demand side Grain index, we can get a more granular picture of the real economic situation of a society. By plotting the ratios of prices of different products and services relative to the Grain index annually, we can even determine the economic direction of a society and can better iron out kinks in a society's supply and demand. In contrast, modern Economics measures the supply-side as gross supply or GDP (Gross product), and measures demand-side as CPI or nominal consumer prices measured in currency. This makes it difficult to value goods and services during bubbles and hyperinflation, causing a disruption in the supply chain like what happened in Zimbabwe. If a financial crisis hits a SORA system, the valuation can merely switch to the Grain index to keep the supply chain humming. Under Economics, a country can theoretically have a single giant corporation exporting everything, having huge GDP while its workers starve to produce those exports at low cost. A GDP standard would still rate the starving country as wealthy. Our dual system, on the other hand, would properly expose the real poverty hidden by the nominal wealth just as it exposed the hidden middle-class poverty in Vietnam and the real poverty in the Philippines. In addition, our dual index eliminates the need for complicated subjective factors that are present in other indices like the Human Development Index, Happy Planet Index, Better Life Index, etc. The subjetiveness is only in what items are pegged aganst the Grain index. 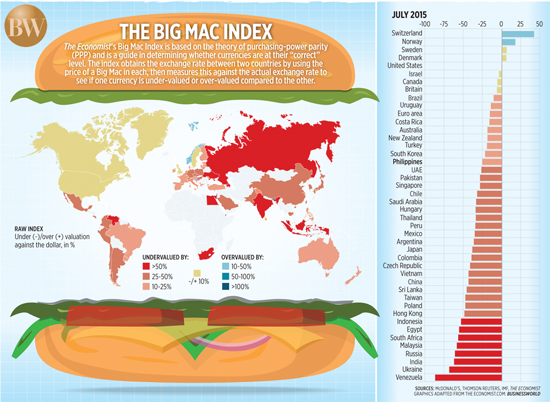 The Big Mac index has some of the basic ideas of Smith's commodity-based valuation system, explained in the Digression, as it uses a real, useful thing to valuate a mere piece of paper with a number written on it. Measure of Supply GDP as Gross Domestic Product or the gross sales in a country Purchasing Power as the net revenue in a country after taxes, or whatever goes to the wallets of employees and business owners. Measure of Demand Consumer Price Index or prices of year X relative to year Y Grain Index or prices of different goods and services relative to grain. For basics, it is fuel, electricity, water, rent, basic medical services and common non-essentials (meat, milk). For luxuries, cars, condominiums, etc. Subjective Measures Arbitrary, depending on think tank (Human Development index, Happiness index, etc) Not-so-arbitrary. Measures are integrated in the items included in the Grain index. For example, a rich country might include prime beef and pork in the index, but a vegetarian country might not. In general, meat is included since Smith included it in his digression.